Not always it´s possible to see all the wildlife surrounding us, but it is possible to recognize these animals, whether mammals, birds or reptiles, through the signals they left. 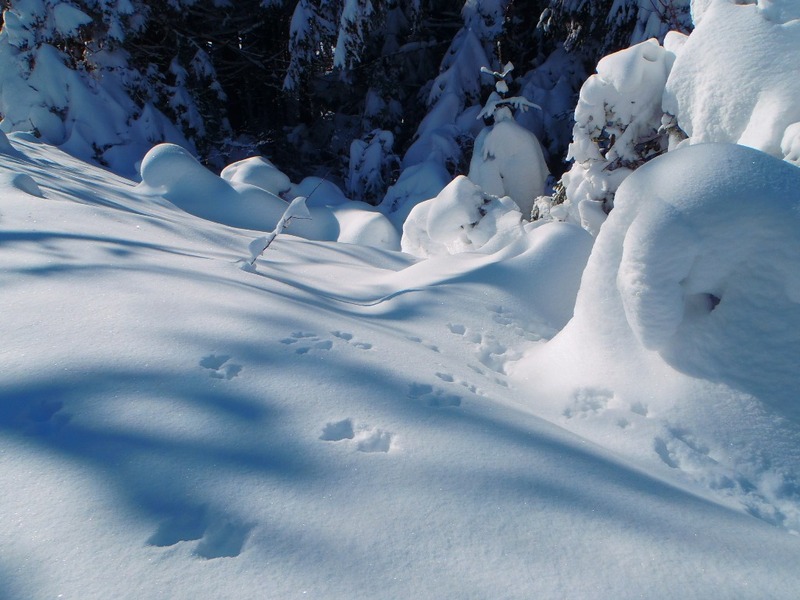 The footprints, scats, dens, feeding marks, leftovers from the prey … give us evidence of their lives and for some animals this are the only way for be sure of their presence. Going out in search of traces allows us to be more conscious (in a non invasive way) about the animals that are living near us. A perfect moment for monitoring wolf tracks is 24-48 hours after the fall of the first snow because once you find tracks, you follow them till they do not split in more and then you know the minimum individuals in that pack. So this Sunday, volunteers went for the second time (the first was in the end of November) to the forest. The aim was mainly monitoring the presence of large carnivores such as bears, wolves and lynxes in the area. For not make it only fun but also serious we use GPS , fill in a standard form for Croatia, and monitoring data are sent to the coordinator for the region. Even if you don’t find nothing, the lack of information is also an information, because the effort you made for finding a track can tell you for example if the specie is rare or not present in that area. This is the first year that we volunteers are involved in the monitoring of large carnivores in Croatia and for that we received a training course. Thus, we are still practicing and looking for ways how volunteers can get more involved into monitoring of large carnivores and contribute to their conservation. The better are made these monitoring the closer to reality will be the estimating of the total number of individuals of a species and their population trend, from which will depend all conservation measures, including interventions in populations (such as hunting). In these two excursions we found many traces of ungulates, rabbits, little rodents, foxes, mustelids and (one) bear tracks! 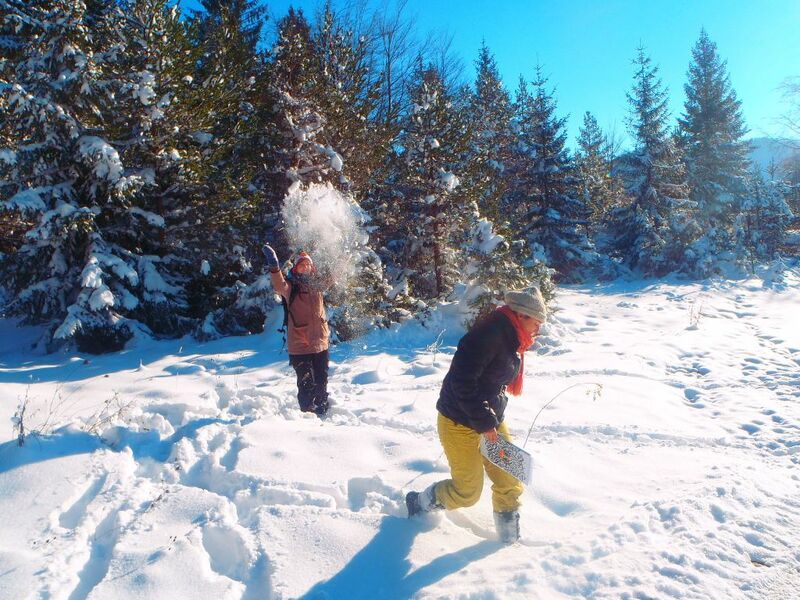 Some of us do not have much snow in the home country and seeing a white forest was really beautiful! One day, the little frog woke up. He looked out of his insulating winter bed of dry leaves, somewhere in his winter habitat in the forest. Finally it is starting to get warmer! And such a nice rain! Every spring, countless amphibians migrate from their winter habitats to the waters in which they lived as tadpoles, they mate and lay their eggs in the shallow water. Many of them have to cross roads which we build in their way – up to 80% of the local population doesn’t survive this attempt. In the Gacka region, close to Velebit, we have this problem too. In our neighbor village Švica are a lake and a pond. On the way to the lake, the amphibians have to cross the mainroad, which connects Otočac with the villages Kuterevo and Krasno. In the first two warmer days we already counted around 70 dead amphibians on that area. As it spring is coming now, more and more animals will start to migrate. Already last year Milo and Daniel, two french EVS volunteers started a project to help them, called „Dobra Žaba“ – good frog. They were working with a team of volunteers of the local high school in Otočac. They informed the people about the problem and built up toad fences to catch the animals and to carry them over the road. This year we continue to help the frogs by informing the public and especially the neighbourhood, with warning signs and information signs and posters, as well as with a cleaning action at the pond. Also we will analyse the roadkill, to see where the most animals cross, so that we can build an effective toad fence. In the next articles we will write some more about amphibians and their important role in the ecosystem. If you also want to help the amphbians, drive carefully when it’s raining and you are near waters, especially during dusk and dawn. Also your local environmental organisations are always happy to get some helping hand with building and controlling the fences. Because only a living frog is a good frog. With the lynx, volunteers in Postaja finished learning about the three big carnivores of Europe. Lynxes are a genus belonging to the family of felines and contrary to the thought that lynxes are simply a big cat they are more related with tigers. Nowadays in the world live four species of lynx. Canadian lynxes (Lynx canadiensis) live in the forests of Alaska and Canada and their hair is light and long to protect from the cold. Eurasian lynx (L. lynx) live in the forests of Europe, Siberia and South and East of Asia. Eurasian lynx is almost extinct in Western Europe and only left a few populations in mountainous areas of Italy, France and Balkans. The red lynx or Bobcat (L. rufus) inhabit in Norteamerica from the South of Canada to the North of Mexico. Iberian lynx (L. pardinus) inhabit Iberian Peninsula and only a few populations remain in the Southweast of Spain. The size of the lynxes is an adaptation to their environment: bigger bodies lose less heat than smaller. As an example Eurasian lynx adapted to colder winters weight between 18 to 30 kg, the Iberian lynx weights around 12 kg, while the red lynx around 6 kg. Contrary to wolves lynxes are solitary animals, but sometimes they meet in little groups to travel and hunt. Lynxes only eat meat and they have an exquisite taste, they feed only in certain animals. Due to the fragmentation of their specific habitat and the reduction of their prey lynx is a fragile specie that should be preserved. To illustrate lynx situation I talked about Iberian lynx to the rest of volunteers. Since the beginning of 20th century the populations and range of the Iberian lynx have been reduced. 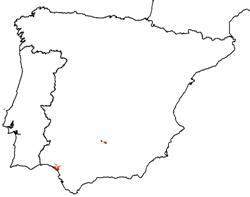 First it was the over hunting to obtain pelts that restricted their range to Southweast of Iberian Peninsula. Then the arrival of a rabbit disease from France made rabbit populations decrease almost to their disappearance. Because of the Iberian lynxes feed principally on rabbits they were on the edge of their extinction in the 90´s. But in 2001 with the LIFE project Iberian lynx populations started to recuperate. Reinforcement of populations to increase genetic diversity, recuperation of rabbit populations and reintroduction in areas where lynxes used to live are some of the actions developed in the project. The success of the project is the last chance for the survival of Iberian lynx. The situation of the Croatian lynxes is not better than in Spain. The remaining populations reach only 50 lynxes in the mountains. The principal threats of the populations are the fragmentation of the habitat and the lack of prey and as well as in Spain there is a Life Project for the recuperation of their populations. The protection of the lynx doesn’t affect only to them but also to the habitat and all the animals and plants that live in there. Lynxes as bears are a symbol of the last wild places that remain in Europe. They probably appeared 100 000 years ago with the first flowers. Actually we know that there are more than 20 000 species in the world and 2500 in Europe. Most of the time we focus our attention in the domestic bees because we only know this way to deal with them: to make them PRODUCE HONEY. Indeed, did you know that the majority of the bees do not produce it? They are wild, and one part live alone, or at least are independent. All bees are vegetarians and browsers insect. That means they fly from flower to flower in search of food like nectar, Propolis, pollen and honeydew. By the same occasion bees ensures the pollination, which means the transfer of pollen to plant reproduction. Their role is essential: 84% of the cultivated plants in Europe depend of the pollination by the bees. Can we imagine a world without those precious insects for the planet…? In many places in the World a lot of bees are disappearing. For example in United States from 1942 there have been a loss of around 45 % in the bee hives. What can produce these disappearing? Several causes strike the bees and their Immune system, and added all together it creates their vanishing. Out the beehive, the extension of monoculture is limiting the diet of bees and the pesticides are finally recognized as a cause of the damage in their nervous system, which can be deadly. Then, during the pollination, the bees are eating those poisons and 2 scenarios are possible: the pesticides damage the nervous system and bees die because are unable to orientate anymore. Or they carry it until the beehive where all the colony can be affected. What is the best up to you? If you want to act in anyway, here you can sign this petition to ban pesticides. About the beehive itself, the rectangular one used for the production of honey doesn´t allow efficient airflow in the corners, which can cause mold installation, as well as parasites and virus: then, the thermal regulation by bees is more difficult and condition of life worse. On the other hand some beekeepers use sugar to feed their bees, to make them produce more honey, limiting once again their diet. What will happen if the bees continue disappearing? The bees are the most important pollinators and many plants depend on them. Their vanishing endanger the survival of plants biodiversity and many cultures around the world. We watched the documentary “Vanishing of the bees” and discovered with terror that there are already several clues: in USA where they import bees by plane from Australia to pollinate monoculture or in China or some people are paying to pollinate by hands because there are not enough bees anymore… we are really loosing the bees right now on the Earth, and before to cry on our empty lands, we should wake up and realize how critical is the situation. About bee hive itself, we can build them in round shape, like in nature, instead of in squared shape. Also, we shouldn’t feed them with sugar but with healthy and various kinds of food. That means modifying their and our environment: avoid monocultures and promote alternative cultures which include many melliferous Flowers, Agroforestry, permaculture, ecological agriculture, traditional cultures… the solutions are multiple, and can start in our own garden! Albert Einstein once said : “If the bee disappeared off the surface of the globe then man would only have four years of life left. No more bees, no more pollination, no more plants, no more animals, no more man”. Last week the Kuterevo volunteers tried to learn more about wolfs, their biology and their functions in the wild. Marco and Alice prepared a presentation about wolfs in Spain and France. To discover more about wolfs we also watched a documentary about a Croatian man who took care of a wolf cub, and another one which was about relationships between wolf packs and other animals in Yellow Stone National Park in the United States. Wolfs are social animals, they live and hunt in packs and have strong bondings. Usually there are 6 to 10 of them in a pack and all the members of the pack provide food for the mother and the cubs. If there are too many wolfs in one pack, some of the younger wolfs (1-2 years old) can disperse: they look for a mate (partner) and start a new pack or join another pack. The wolf is a key species. They control populations of other animals and always hunt the weakest ones. Also, they are scavengers, so they keep natural areas clean and prevent diseases from spreading. There are different subspecies with different color patterns: the Yukon wolf (black and grey) in Alaska and Canada, theEuropean wolf (brown-grey), the Arabian wolf (light blonde), and the Arctic wolf (white). Wolfs have conflicts with farmers and livestock but they only affect around 1 % of the livestock in regions where they are present. They live in very different habitats, not only in the forest. They can eat many kinds of animals, but their diet mainly consists of ungulates (http://en.wikipedia.org/wiki/Ungulate). Nowadays wolves are rare in the forests near Kuterevo. People who work in the woods say that about ten years ago there were much more wolf packs than now. We now informed ourselfs about two out of three of Croatia’s biggest carnivores: bears and wolfs. The third biggest carnivore is the Lynx, and we will learn more about this animal this week, as it is the ‘Topic of the Week’. During our times as volunteers in Kuterevo, we had of course already learnt some things about Brown Bears. However, there are seven other species of bears, spread around the world. We thought that it would be interesting to learn about these other bears, and to compare the situations of bears in other countries – in the wild and in refuges – with the situation in Croatia and in our refuge. We therefore decided to all get more informed about this topic during two weeks. We all specialized in some topics and presented them to each other, and we watched two documentaries, one about the Panda and one about the Asian Black Bear. The two ´bear weeks´ were very interesting, but also somewhat depressing. Worldwide, bear numbers are decreasing almost everywhere due to human activities. The only well protected bear is the Panda. Does a bear species have to be nearly extinct, cute and fluffy, and an international icon of nature conservation before it finally gets the respect and protection it deserves…? We started the bear weeks with an interesting presentation by Marco about the biology of all the eight different species of bears that exist. Later, we all got more informed about the situation of bears in different parts of the world, including their threats and conservation measures that are taken. Below, we give a summary of these presentations. Map: Distribution of American Black Bears (2010): Canada and US. Map: Distribution of Asian Black Bears (2010): mainly mountainous areas in Asia. Source: IUCN Red List. Map: Distribution of Polar Bears (2006): around the North Pole. The Sun Bear, living in Southeast Asia, is the smallest of all bear species, with adult bears weighing just between 27 (females) and 70 kilos (males). Polar bears are the biggest bears. Male adults on average weight 720 kilos. When they stand on four feet, they measure about two meters from toes to shoulders! The weight of bears is very variable and depends a lot on their diet. All bears have the biology of carnivores, although most species eat more than 50% vegetarian food. Polar bears are real carnivores, eating mainly seals, while Pandas eat almost only bamboo. Sloth Bears feed mostly on insects, and their mouths are pointy and suitable for getting insects from trees. Brown Bears occur in a big part of the world, and their diet varies between different areas. In Croatia, the diet of Brown Bears consists for only about 5% of meat. The Brown Bears in Finland eat almost 30% meat. The Grizzly Bear in North America is a subspecies of the Brown Bear, and these bears eat 10 to 40% meat, including fat salmons. Unlike the Croatian Brown Bears, most bear species don´t hibernate. Only some bears in cold areas go into hibernation during winter. The numbers of most bear species (excluding Brown Bears) have been declining for many years. For example, both the number of Moon Bears and Sun Bears has decreased with more than 30% in the past three decades. The main threats for bears are all related to people. Numbers of bears are declining because of hunting, poaching and destruction of their habitat. In many countries in Asia, bears are hunted for body parts which are by some said to be healthy to eat or to bring luck. Mainly Sun Bears are also hunted and kept in farms for their bile: the digestion fluid in their gall blatter, which is used as a traditional medicine. Most bear species are classified as ´vulnerable´ on the Red List of the IUCN (link to www.iucnredlist.org), which means that there is a high risk of endangerment of the species in the wild. The Panda is listed as ´endangered´, because there are only several thousand individuals left in the wild, spread over isolated areas, and there is a considerable chance that the species will die out in the wild. The Brown Bear is the only bear species to be globally listed under ´least concern´ by the IUCN, even though their numbers have been decreasing considerably. In most countries where threatened bears reside, the bears are protected by law and it is forbidden to hunt them. However, in many countries these laws are badly implemented. This is mainly the case in vast countries outside Europe. The Panda is a special case. As it is much endangered and very mediagenic, there are many programs to help it, and there are severe punishments by the Chinese government for poaching. 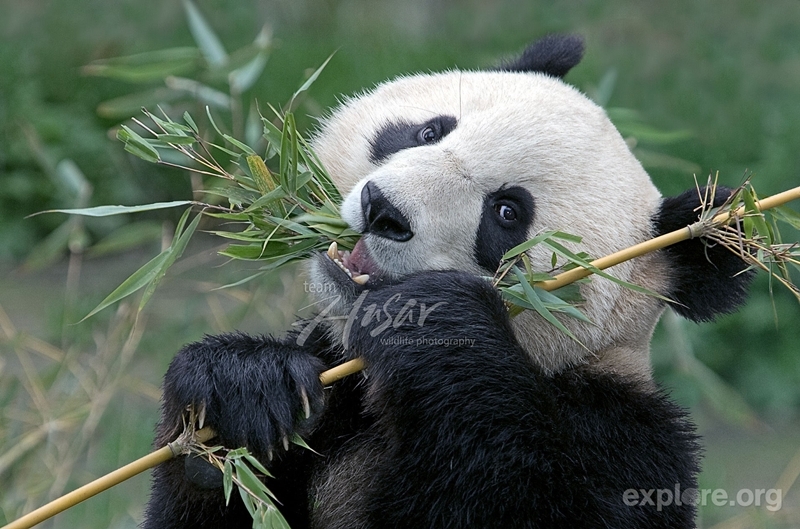 Panda habitat is being restored and different areas in which Pandas reside are being linked together. Also, Pandas which are raised in captivity are being released into the wild. We found it interesting to inform ourselves about other bear refuges in the world than Kuterevo, to learn about the situation of bears in refuges in those countries. Marco made a detailed presentation about 7 other refuges: 3 in Europe (Germany, Netherlands and Hungary), 2 in Southeast Asia (Cambodia and Indonesia), and 2 in North America (USA and Canada). We discovered different ways of managing the bears in refuges, like in North America: after rehabilitating the orphan cubs, they release them in the wild. Even though there it is possible, in Croatia this action would be deadly for the bears: the forests here are fragmented and the bears have lost their natural instinct in the enclosure, and they would probably get close to humans again to look for food… then they would die or have to go back to a refuge. To finish, most of these refuges are run by volunteers and we can stress two important aspects: the refuges propose educational workshops about bears, and work thanks to donations to finance for example new enclosures. The first aspect has, we hope, a direct link with the second: if we succeed to inform people about what bears need to live peacefully and how people should behave when they meet one of them, then maybe less bears will arrive in the refuges because they were too much in contact with humans. Then, we won’t need more enclosures anymore to welcome bears. Unlike zoos, we don’t wish to keep bears in enclosures, but work to make people understand that one of the best ways to love and respect nature, is to let it its wilderness, bears included. “Dobra žaba” means good frog in Croatian. This project was in the head of the Kompostalja volunteers since October, and it became a concrete action in the village of Švica. This project came from one idea : the frog are tasty (French point of view) but as well menaced in all europe. Indeed, according to the IUCN (the International Union for the Conservation of Nature) diagnostic, one third of the amphibians species are in danger of extinction. This is a bad news for the frog eaters and it means that human’s activities have a strong negative impact on those animals … Desperated by this bad news, we wanted to save all the amphibians of the world but first we’ve decided to begin in the village of Švica, near Kuterevo. 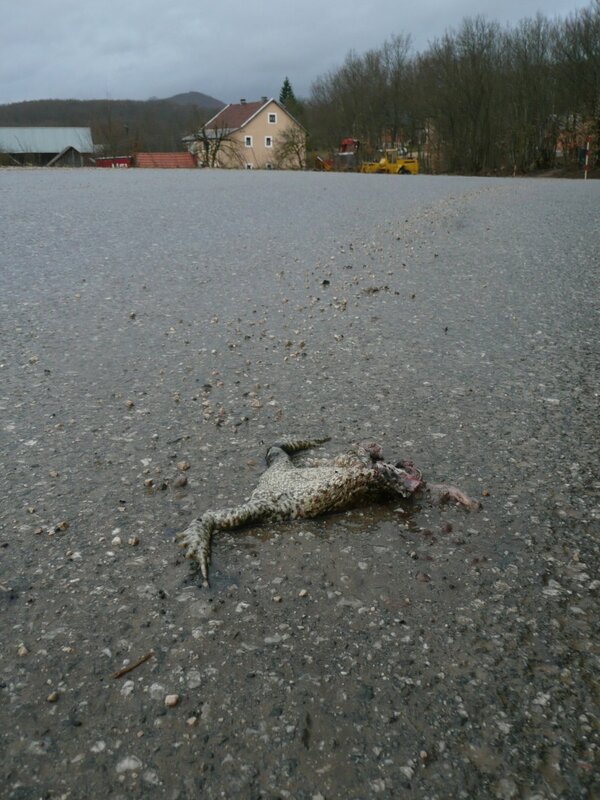 There, peoples know that a lot of frogs die every year because of human’s activity and mainly because of car’s traffic. For our saving actions, we needed some help and we searched for it in the city of Otočac. Here we founded the motivated support of Goran Bukovac and several volonteers from srednja škola! 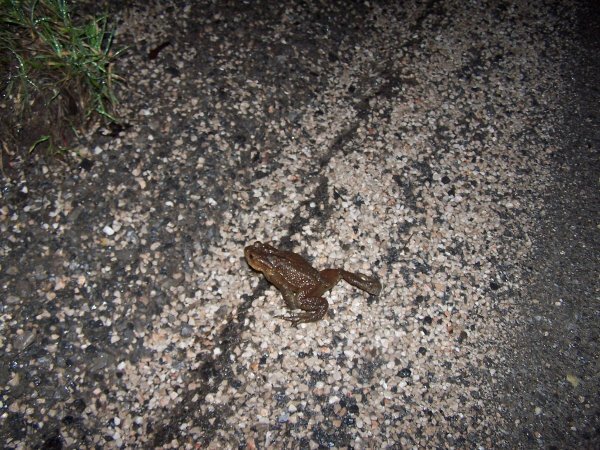 In order to avoid that amphibians dies on road, we’ve installed a protection system of 80 meters. In our buckets and on the roads of Švica, we found an interesting diversity of 4 species. We saved, with this system, only twenty amphibians. This few number show first that not a lot of frogs crossed roads this year but as well that 80 m of nets is not enough to have a concrete impact against the mortality on the road. But this spring of actions had the benefit to sensibilisate people about the frog protection: thanks to the newspaper “Novi list” the information spread until Rijeka ! The next step of the project is to organize some comunication event to continue to sensibilise people about the impact of human activities on frog population. For this we are planning to make workshop in schools, presentation in the library of Otočac and interactive stand during the market day For the benefits of the frogs, we hope that the project will be continued the next year, in bigger proportions, in order to propose a real protection plan for the frogs of Švica! In this way the future of the project is in the hand of the volunteers of Otočac or who knows, of the Kuterevo team of the next year !